Pentecost was a Jewish harvest feast 50 days after Easter when fruit had ripened and wheat was harvested. Along with bringing produce to the temple, it was also an anniversary of the giving of the law (Torah)- 10 commandments to Moses on Mt Sinai. There are fulfillment and replacement hints in the text following the interpretive principle that the Old Testament is fulfilled in the New Testament. * Israel together at Mt Sinai – Disciples gathered together in upper-room. * The earthquake and storm and eruption – driving wind & fire. * Moses speaking personally to God and being gifted with ʻlawsʼ to teach and guide. – Tongues of fire communicating Godʼs spirit and power to teach and guide and unify all people. How would you write what Pentecost ʻmeansʼ? Pentecost is also understood as the reversal of the OT Tower of Babel story (cf.Gen 11). Humankindʼs sin and self-importance building the tower to reach, and equal God, eventuated in the scattering of people and the confusion caused by different languages. The gift of the Spirit at Pentecost unites people to understand each other and the Christian message. Does the world today need to hear about Jesus in a fresh and creative way? Where would you start? Be inspired! Paul wrote to the Community at Corinth because some people who didnʼt have the gift of tongues were considered inferior. It was causing division in the community. One gift was not to be stressed over another. Everyone is gifted. Name and claim at least 3 gifts you have. What gift do you feel you would like to develop more and use for God and the community? involved in serving God with this? Jesus passes through ʻfear -locked doorsʼ to bring peace and forgiveness. What ʻlocked doorsʼ are present in your life? Use your imagination in a time of prayer and allow Jesus to meet you on the other side of these locked doors….. what happened? away. Bend the stubborn heart and will; Melt the frozen, warm the chill; Guide the steps that go astray… (Sequence prayer of Pentecost ). Which prayer ‘image’ to the Spirit speaks personally to you? Why? Pentecost was a Jewish harvest feast 50 days after Easter when fruit had ripened and wheat was harvested. Along with bringing produce to the temple, it was also an anniversary of the giving of the law (torah)- 10 commandments to Moses on Mt Sinai. There are fulfilment and replacement hints in the text following the interpretive principle the Old Testament is fullfilled in the New Tesatement. Israel together at Mt Sinai. The earthquake and storm and eruption – fire. 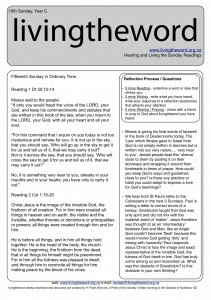 Moses speaking personally to God and being gifted with ‘laws’ to teach and guide. Disciples gathered together in upper-room. Tongues of fire communicating God’s spirit and power to teach and guide and unify all people. 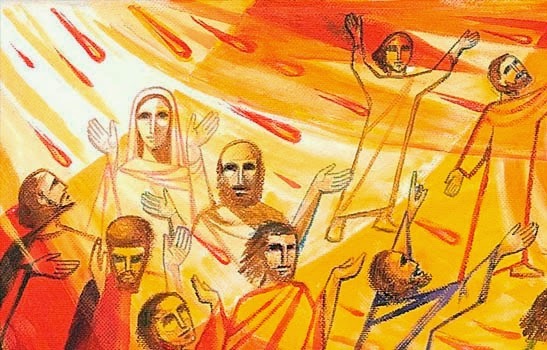 How would you write what Pentecost ‘means’? Pentecost is also understood as the reversal of the Old Testament Tower of Babel story (see Gen 11). Humankind’s sin and self importance building the tower to reach and equal God eventuated in the scattering of people and the confusion caused by different languages. The gift of the Spirit at Pentecost unites people to understand each other and the christian message. Does the world today need to hear about Jesus in a fresh and creative way? Where would you start? Be inspired! Paul wrote to the Community at Corinth because some people who didn’t have the gift of tongues were considered inferior. It was causing division in the community. One gift was not to be stressed over another. Everyone is gifted. Name and claim at least 3 gifts you have. What gift do you feel you would like to develop more and use for God and the community? The Spirit and ‘gifts’ are connected to and give life to the ‘body’. Which part of the ‘body’ do you identify more with: eyes – seeing, head – thinking, heart – feeling, hands – serving, mouth – speaking, ears – praying. How do you show this in your daily life? How could you be more involved in serving God with this? Jesus passes through ‘fear -locked doors’ to bring peace and forgiveness. What ‘locked doors’ are present in your life? Use your imagination in a time of prayer and allow Jesus to meet you on the other side of these locked doors….. what happened? The Spirit sends the Disciples / the Church ‘on mission’. The Church is ‘plugged in’ to a living power-source moulding everyone into the image and consciousness of Christ. Because of the Spirit the Church has the calling and capacity to be the extension of Jesus’ ministry in the world. Forgiveness of sins and the healing of wounded hearts, families, communities is what each disciple is ‘sent’ to do. Consider what feelings and thoughts arise in a person when they are ‘sent’ with authority to do something? Are you conscious of being sent out by the Father to ‘repair the world’?